Root Admin: Can access & manage both virtual & private resources. Domain Admin: Can access only virtual resources owned by administrator’s domain. User: can access their own virtual resources. A CloudStack architecture consists of two parts: The cloud infrastructure & management server. CloudStack management server is running on one machine & another machine running the cloud infrastructure (hypervisor). 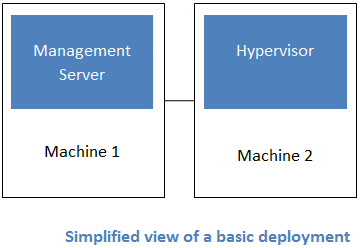 In small deployment, a single machine can act as both management server & cloud infrastructure. Below mentioned is brief description of both the architecture. Host: Host is a single computer node on which a hypervisor is running virtual machines. Cluster: Cluster contains one or most hosts of same hypervisor & dedicated primary storage. Primary storage: Primary storage stores disk volumes for virtual machines. It associated with a cluster. Cluster have at least one primary storage. Pod: Pod is a rack which contains one or more clusters & layer 2 (L2) switch architecture which shared by all cluster in pod. Zone: Zone has one or more pods & secondary storage, which is shared by all pods in the zone. Zone is equivalent to a single data center. One or more zones represent cloud. Zone can be public or private. Secondary Storage: It stores all templates ISOs & snapshots. It associated with a zone. Management server manages cloud resources such as storage devices, IP addresses & hosts. It manages physical or virtual resources through management network. It runs on dedicated server or virtual machine. Administrator can interact with management server by using user interface (UI) & API. By interacting with management server, you can manage & configure your cloud infrastructure. It provides UI & API for CloudStack. It manages the cloud resources. It manages snapshots, ISO images, templates. It can manages multiple zones. It can be deployed as physical server or virtual machine. It manages the assignment of guest virtual machines to hosts. It manages the assignment of public & private IP addresses. If you are using more than one management server, you need to have a load balancing service above the management server. CloudStack offers basic & advanced networking scenario. Basic: In basic zone, you have one guest network & no public network. In this set up, guest instances use the same IP range. Advanced: In advanced setup, cloudstack allows for a public network & creation of guest networks. It is for more sophisticated network topologies.